We’re starting to see a few signs of spring. The warning signals usually start below ground or just above it. I’ve seen one-inch-tall iris bulbs in front of a neighbor’s house, and the moles in a nearby park are excavating very quickly, as if they are part of a crew that will get paid only when it completes the job of destroying a lawn. 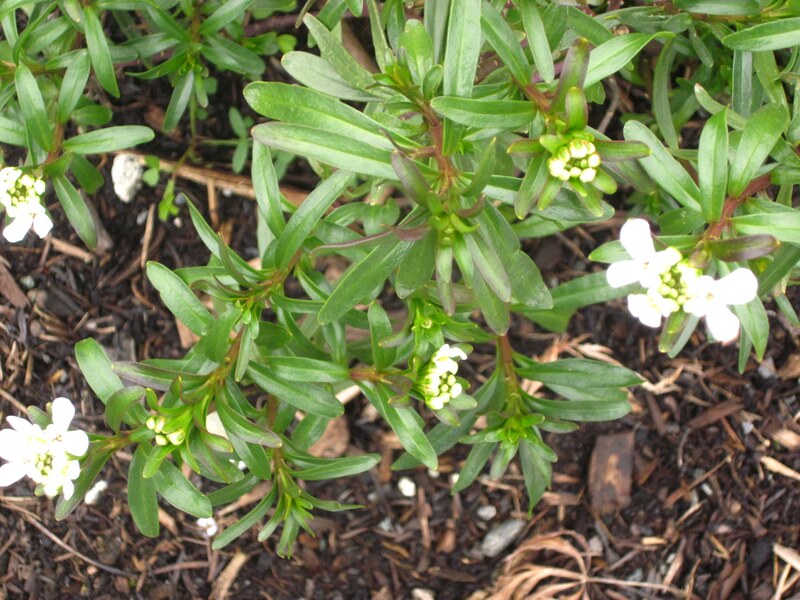 Six inches above ground my candytuft is beginning to bloom. And on a walk today, I spotted the first two yellow blossoms on a forsythia bush. Later in the month I’m expecting fruit trees to flower. The other signal of an impending change of season is that it is possible to walk outdoors without an umbrella (now and then). I haven’t looked in a clothing store recently (I wear a variation on the same outfit every day), but I’m sure that swimsuits will be coming soon to a display window near you, near all of us. In the Northwest, spring arrives early, but never early enough. Three months of dark, cloudy, windy, and/or rainy days, and we’ve all had enough of winter. By February, teenagers, fed up with the gloom, are putting on their shorts and flip-flops regardless of the temperature. Primroses are everywhere — even though they may freeze or drown in a few weeks. Sunglasses come out if the sun even hints that it’s going to shine. Neighbors crawl out of their houses into their gardens and start to attack winter’s weeds. I subscribe to The Writer’s Almanac, which sends me a daily poem. I admit that some days reading them becomes a chore, but other times they provide a perfect theme for the day. Today’s was called “Sonnet: Daffodils,” by Gavin Ewart. Ewart refers to the first arriving daffodils as exhibitionists rising from the dead, but says that when many more bloom, and we are surrounded by a profusion of yellow they become trite and we stop noticing them. My first thought was that I could never get bored with spring. I didn’t sustain that one for long, because I moved on to the lines about shriveling and then growing crinkly, papery and tired. They stand out because they’re an apt description of old age. Here’s hoping that for all of us who will turn crinkly and tired some day, we too will find a way to emerge again every spring, not from the ground, but in what we’ve left behind and in the minds of people who knew us. This entry was posted in aging, aging and appearance, seasons and tagged blooms, daffodils, spring. Bookmark the permalink. This is a spring I am looking forward to with greater anticipation than usual, as I wait to see the new bushes in my new back yard come into bloom. Hi Ann! My name is Maegan Badham and I’m the Administrative Assistant in Publications for AVID Center. I’ve been trying to get in contact with you regarding a review you wrote, that we would like to get permission to use at our 2013 AVID Summer Institutes and Path Trainings. You can reach me at mbadham@avidcenter.org or by phone at 858-380-4097. I look forward to speaking with you to discuss this opportunity!